Even the smallest flood can cause major damage to conventional residential or commercial flooring. So why not install a flood proof flooring system that can withstand minor flooding and water damage? A floor that at the same time can be elegant and beautiful or industrial and modern. It is available with flood proof flooring options from Elite Crete Systems and it can be much more cost effective than you think. The flood proof flooring featured on this page was applied directly to an existing concrete surface that previously had tile installed. Total thickness of the finished new floor is less than 1/8″ thick but don’t fear wear and tear. These floors are tough. Tough enough to take vehicular traffic and even drive a forklift on them. 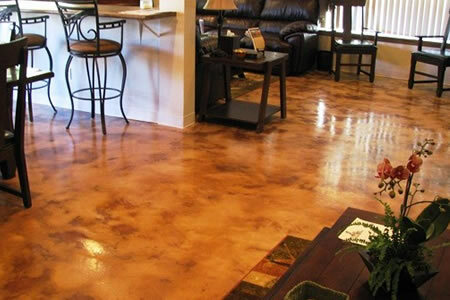 The floor below is what Elite Crete Systems refers to as a “Slate Trowel Down” without seams and was created with THIN-FINISH™ Pre-Mixed Overlay, colored with CHEM-STONE™ Reactive Stain and sealed and protected with E100-PT1™ 100% Solids Clear Epoxy and two coats of AUS-V™ Clear Urethane Top Coat.